starting with a great hero story straight from Robert Tiedeken, our Branch Manager in Radwell-Indiana. 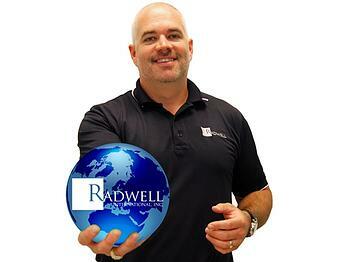 Rob has been with Radwell International for 10 years this April. He was a career IT professional and started with Radwell as a Systems Administrator. He was promoted to IT Operations Manager and in this role, he worked on design and buildouts for Radwell-UK, Radwell-Canada, Radwell-Texas and Radwell-Indiana. An unexpected opportunity arose for him when he was asked to take on the challenge of being a Branch Manager in Franklin, Indiana upon it’s completion. He took on the challenge and has never looked back. Rob is a great leader for Radwell-Indiana and does a great job building his team and creating a sense of community both with his employees as well as his clients. 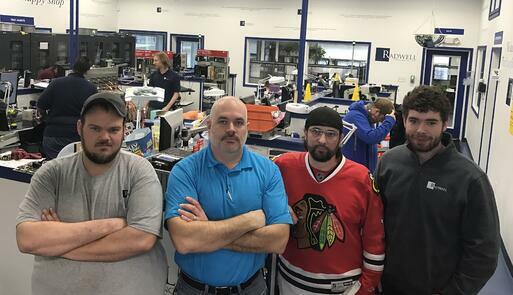 In November of 2015, as we worked to build business and capitalize on opportunities, a contact I had made at a vendor show in Cleveland came into our branch with an emergency motor repair for one of his customers. He was frustrated that he and his customer weren’t getting emergency service from their 3rd party sources. He was clear that he needed the motor repaired ASAP. This was his first time working with Radwell and his first time in Radwell’s Franklin, Indiana branch. We assured him that we would put urgency on his repair. He also inquired about field service, as the customer was having many issues onsite that no one was able to resolve. I let him know that we did do field service and quoted him our standard pricing. The next day I received a call that his customer was willing to pay good money, for good people. He had researched Radwell and our capabilities and was ready to jump on board with us. I assembled a team of our finest to go onsite and pursue this opportunity. I brought our motor technician, drives technician, and Production Manager.. On our way to the customer, I received several text messages that Brian Radwell, the President of our company, was in our branch for a visit. We continued heading towards the customer because they are our priority. Brian Radwell would understand and encourage this. Upon arrival, we were marched into our customer’s corporate conference room filled with top management and their corporate VP, all who assembled to get the issue resolved. I introduced our team and explained our approach. Our first step was going to be discovery. We would then meet with their maintenance technicians, observe the errors, and form a plan of attack. We assured the customer that we would see it through to resolution. We received full service and access to the manufacturing floor, the assistance of onsite maintenance technicians, software to view the drive diagnostics, and radios to contact anyone we might need while diagnosing. Within an hour and a half, our engineers identified the issue. They also found a problem with the terminology and error reporting from the HMI. Our drives technician researched the errors being thrown on the drive and our motor technician identified the encoders as the problem on the motor. Our technician did some searching on our website, Radwell.com, and realized we had 4 of the encoders in stock. I dispatched a courier to deliver the encoders immediately so we could proceed with the repair. Once the order was generated, we met with the team again in the conference room to discuss our findings and plan of attack. The encoders arrived at my door the next morning at 12:30am. I passed them off to my Production Manager at 3:30am, and we had our motor technician performing the repair at 6am. Following the repair and successful testing, we delivered the motor back to the customer. Upon installation, we suited up and oversaw the installation. Once the motor was installed, and the machine started running, we quickly realized the repair was a success. We returned to the conference room to debrief. We had additional encoders delivered in order to accommodate additional repairs and we added more to our stock for future support. I provided the customer a full field service report along with suggestions based on the errors and data to secure their uptime going forward. We also educated the customer on the error reporting issues and gave hands-on training on the difference between a resolver and an encoder. This was a big win for Radwell-Indiana and our customer. Our team from Radwell-Indiana was able to go onsite for a customer to diagnose their problem and get them up and running in a day’s time. We were able to accomplish what other engineering firms were not able to. We also leveraged Radwell’s inventory and expertise, along with our local presence to do what we do best: support our customer’s uptime and operation. We continue to see many motor repairs from them and continue to support their operation. By being solution oriented and going the extra mile for our client, Radwell saved this customer from losing a large contract, due to downtime, and allowed them to increase their capacity due to our solution.